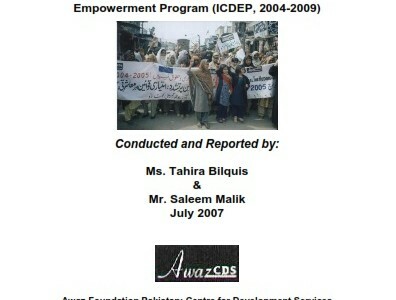 The report comprises of the value chain assessment of key livelihood trades identified in the 40 villages of District Muzaffargarh, Rajan pur, D G Khan and Multan, where Awaz started implementing its Integrated Community Development and Empowerment program. 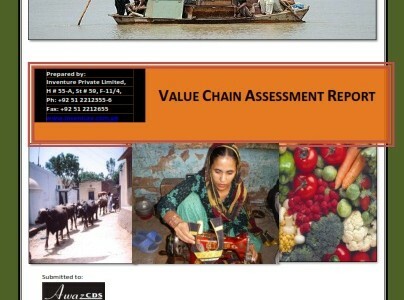 The aim of the value chain assessment was to identify those trades which can be of key focus of Awaz in the shortlisted 40 villages to economically uplift the target communities, especially women. The adopted methodology was multi-faceted and mainly based on the primary data collected during this survey as well as previously collected by Awaz during early recovery phase of development for targeted communities after floods 2010. A range of secondary sources were also used through comprehensive desk review in order to get maximum information about identified trades. The data analysis enlightened about range of trades related to target communities, however, due to resource limits, only four key trades were shortlisted for in depth analysis i.e. livestock Farming, poultry rearing, embroidery work & sale of dairy products. The analysis not only reveals value chains & their maps but also the constraints which hinder in way of their effectiveness and maximum benefit to the communities. Specific trades-related recommendations are also part of the report which could be utilized for effective program delivery.